There were some leftover cooked soyachunks after preparing these low fat soya aloo kofta,i simply went making this pinched fritters aka killu pakodas with homemade barley flour with usual spices along with those leftover soyachunks.For making barley flour yourself at home,just simply dry roaste pearl barley and grind as fine powder, finally sieve it to get the barley rava and barley flour.I'll be posting soon a upma with barley rava and an another interesting savoury snack with barley flour as am gonna make as diwali special. Coming to this pinched fritters, i mixed gram flour,rice flour and barley flour together for making these crispy beauties. 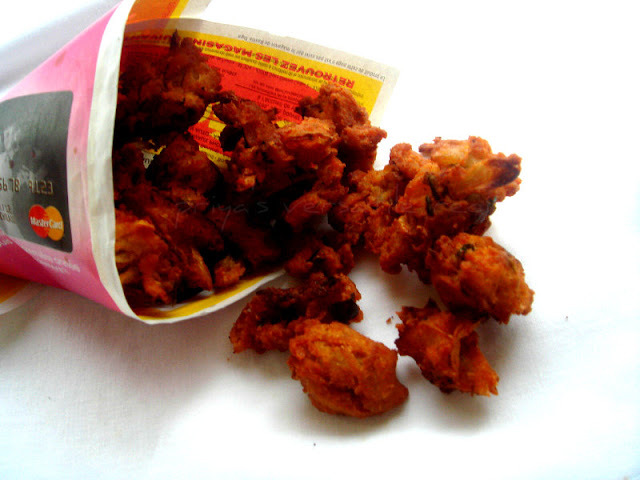 Grounded soyachunks with onions turned this fritters simply awesome,addictive and flavourful. If you make these fritters at home,am damn sure you will keep on munching them, yep its quite hard to stop munching this delicious pakodas.Sending this fritters to my own event CWS-Barley guest hosted by wonderful Roshni. Take the coarsely grounded soyachunks,chopped onions, barley flour, gram flour, rice flour,grated ginger, chopped green chillies, fennel seeds,curry leaves and chopped coriander leaves with enough salt. Mix everything well,springle some water and turn everything as a thick dough. Take a golf balled size batter and pinch gently a small quantity of this dough and drop gently to the hot oil, fry until they turns crispy and golden brown.. Enjoy hot with a cup of coffee..
How come you end with such amazing combinations, Priya?? Lovely snack..
You are a great chef Priya! I need a person like you to satisy my food craving. love you! perfect fries with evening coffee. looks awesome. so crispy and tempting!! well done Priya! Awesome combination... very tempting and lovely pictures! Yummy looking fritters.. Very healthy ingredients too. Great healthy combo,crispy and delicious. versatile..hw many times shud i chant this while reading ur blog..chanceless priya..
Love the idea of making fritters with soya. Should try it sometime. Nice crispy ones with whole lot of innovation Priya. Amazing recipe Priya..just what I need for the cold weather..you come up with such tempting recipes. Looks crispy...very delicious and tempting too. lOVE THE PERFECT COMBINATION. Keep rocking Priya..